Now you can enable facebook like, comment for each post of your blog. Sometimes people need to get registered on the site in which they want to comment on any blog. But it seems difficult to comment by registering on any site. I will give you a plugin. 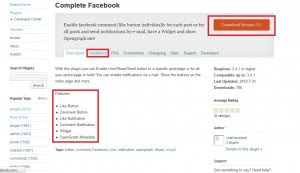 With this plugin you can enable like, share for a specific post or for all post or blogs. At first, you have to go to the following site. 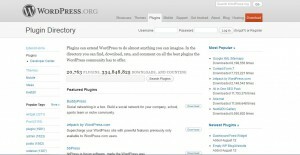 On the top of the page, you will see a heading WoRDPRESS.ORG. Beside this, you will see some menu. From these, you have to click on the menu plugins. Then a window will start to load like the following figure. From the window, you have to search your required plugin. You will see a search box above Featured Plugins. You have to type Complete Facebook on that box and search. See the search result like the following figre. You will see many results related with complete facebook. You have to choose the first one. Click on that, and see like the following figure. For your convenience, the download option is marked with red color. Click on that. If you want to know anything about installation this plugin, then click on the red marked install option. If you want to know the plugin feature, then you will see some red marked features on the bottom of the page. At first, login to your blog > dashboard. From that, you will see an option named plugins. Point the mouse on that. You will see some sub-options. Like, Installed Plugins, get one more etc. click on get one more. Then a new window will start to load like the following figure. Click on the red marked box of the above image. So that, you will go to the uploading page. Click on that, you will see like the following figure. Click on the browse button and show the downloaded file. then click on the button which is beside the browse button. Wait for a while, for installing the plugin. No more today, have a good day friends…..!